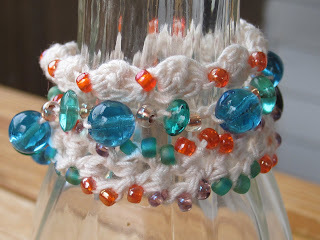 This is the second installment of our Beachy Little Bracelet series. 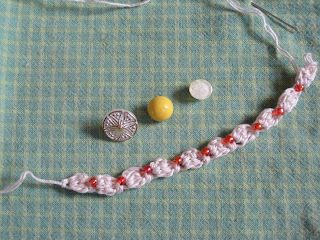 Last time we made Sea Glass (the middle bracelet in the photo below), a super easy chain stitched project. This bracelet is made with two strands of No. 10 crochet cotton (I used DMC Baroque), and a Size F hook. 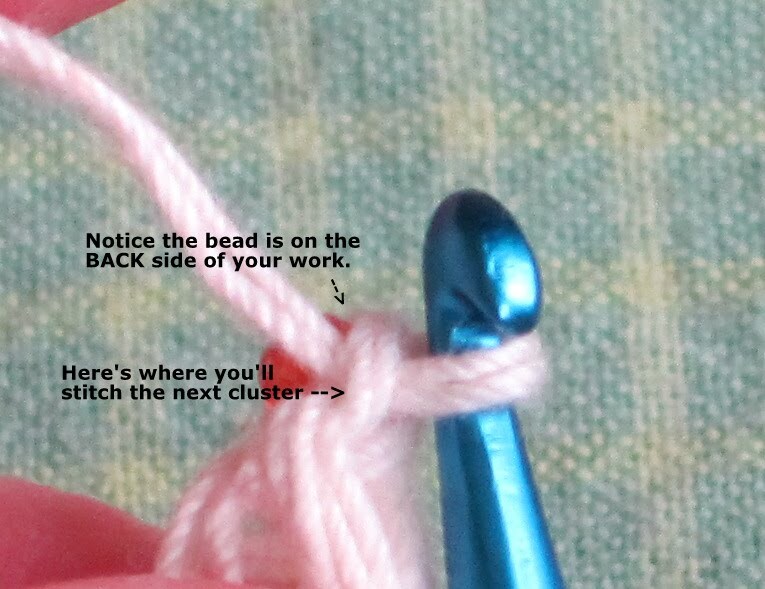 You can use a smaller hook if it feels more comfortable. 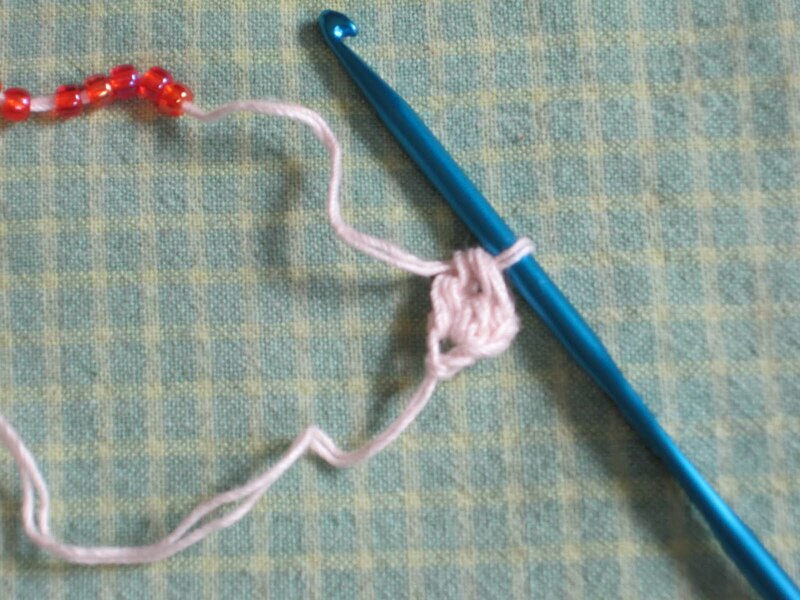 Make your bracelet just a bit snug. The cotton will relax a bit with wearing. 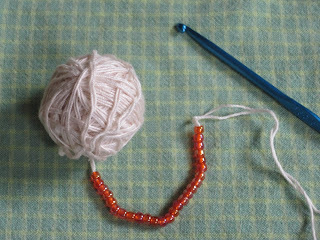 String the beads on a double strand of cotton. 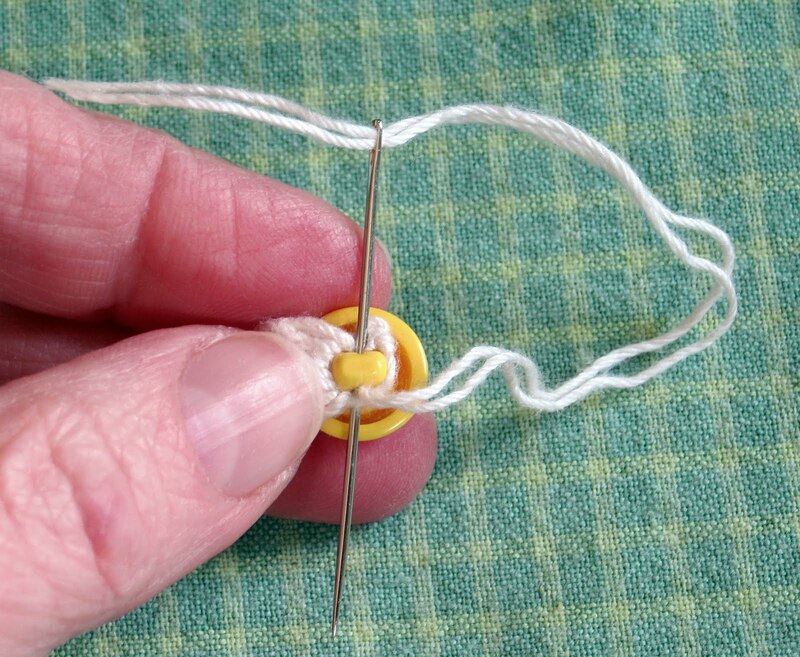 It's easiest done with a needle. 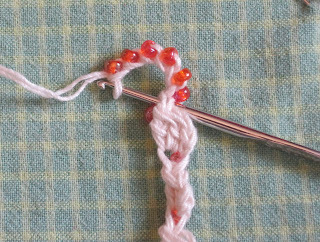 If you don't have a needle that fits through your beads AND can accommodate 2 strands of thread, string them on one strand first. 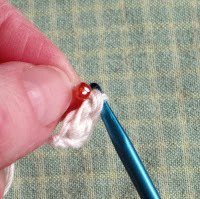 Then thread the needle with the other strand and run it through the beads again. Be careful not to pierce the first thread with the needle as you pass it through the beads. Then make a 2-double crochet (2-dc) cluster in the first chain. Now pick out a button, if you haven't already, to use for your clasp. 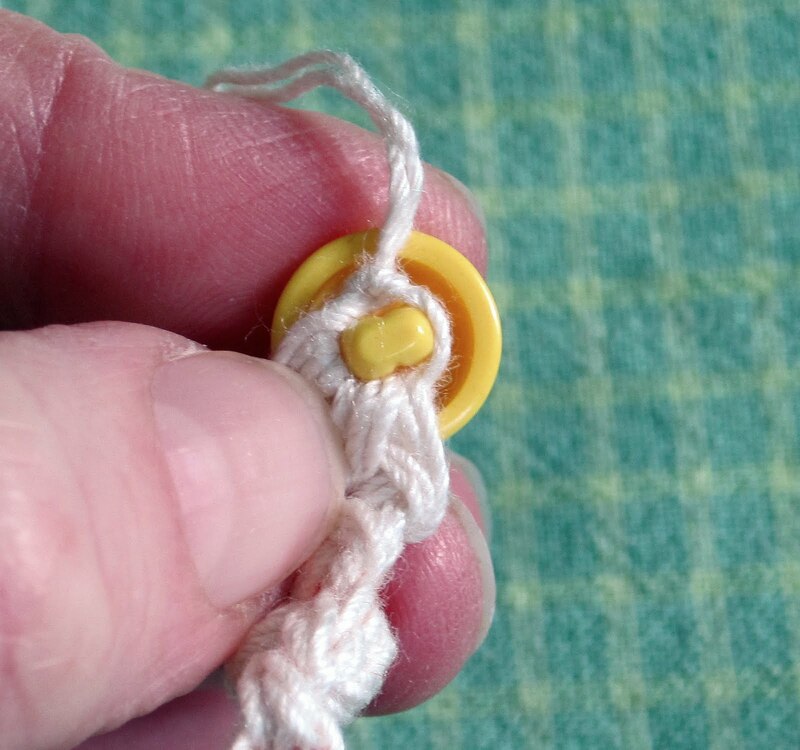 And the lucky winner is...the yellow shank button! 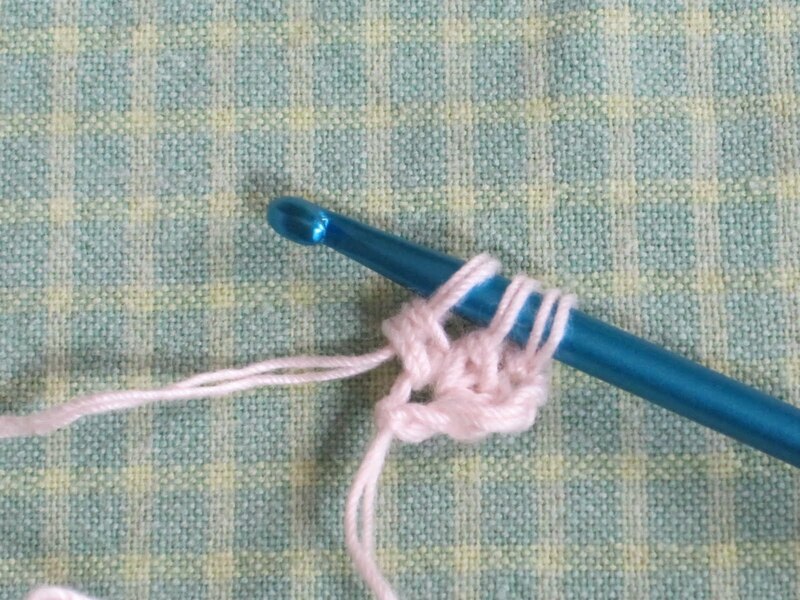 I threaded the yarn on a needle, and passed it through the buttonhole as many times as I could, looping it over the shank, until I couldn't get the needle through the hole any more. Then I removed the needle and tied a knot with the 2 thread ends, right up next to the shank. 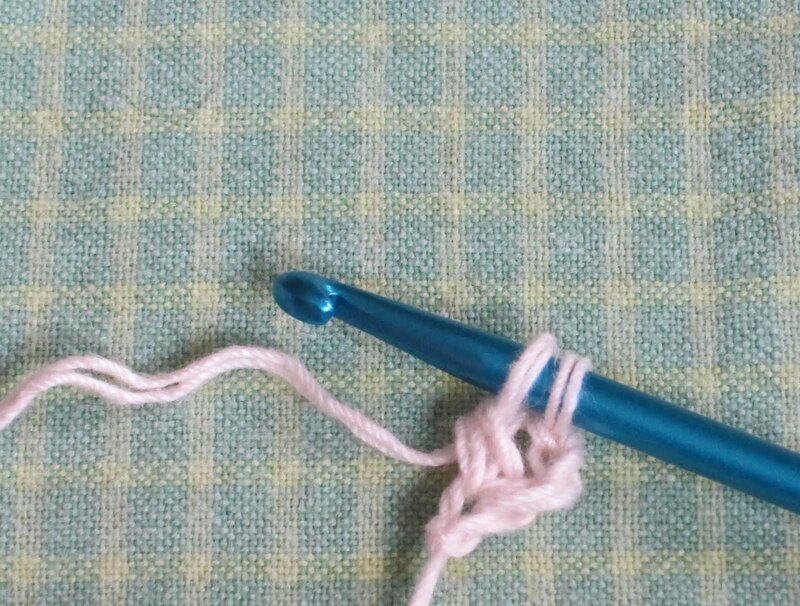 You could probably cut the thread and leave it like this. And slip stitched them into a circle. Don't they look cheerful? I love orange. I crocheted another tight short chain with the thread ends, pulled the thread through, cut it, and hid it in the back of the cluster (just like I did at the other end). And my bracelet was done. Doesn't the yellow button look like a little sun? 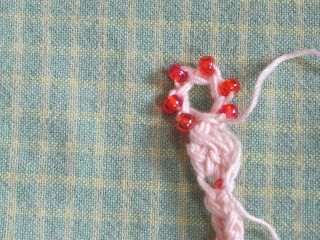 Stay tuned for the next Beachy Bracelet: Waves. This is so pretty! I'm definitely going to make it! It's very quick and easy. Let me know how it works out for you! How much thread do you start with (approx how many yards)? Thanks for sharing this beautiful bracelet on AllFreeBeadedJewelry cuz that's how I found you; prepared to be popular! ;-) you did a fabulous job! I am thinking of making this into a beaded belt! 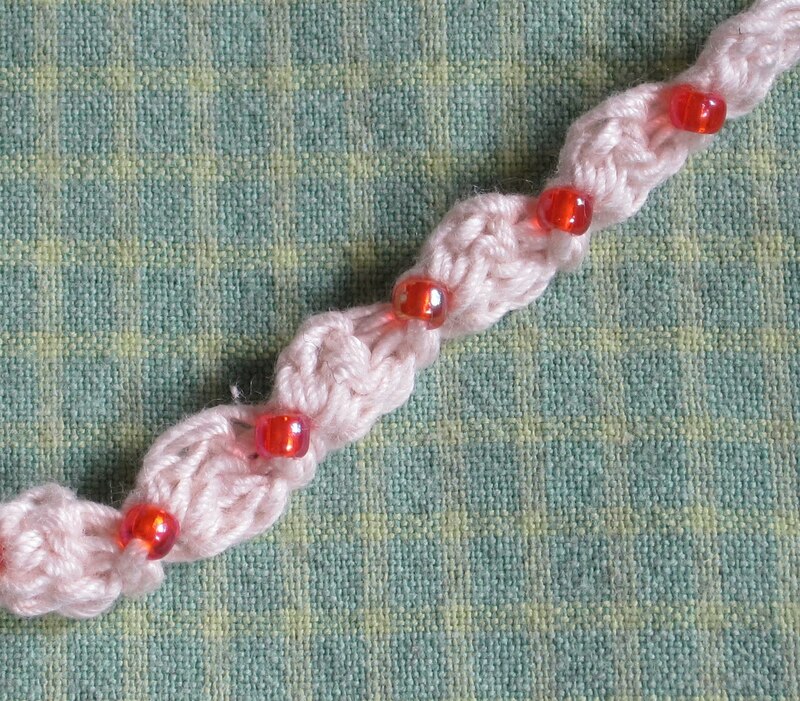 I think it would make a great little belt. 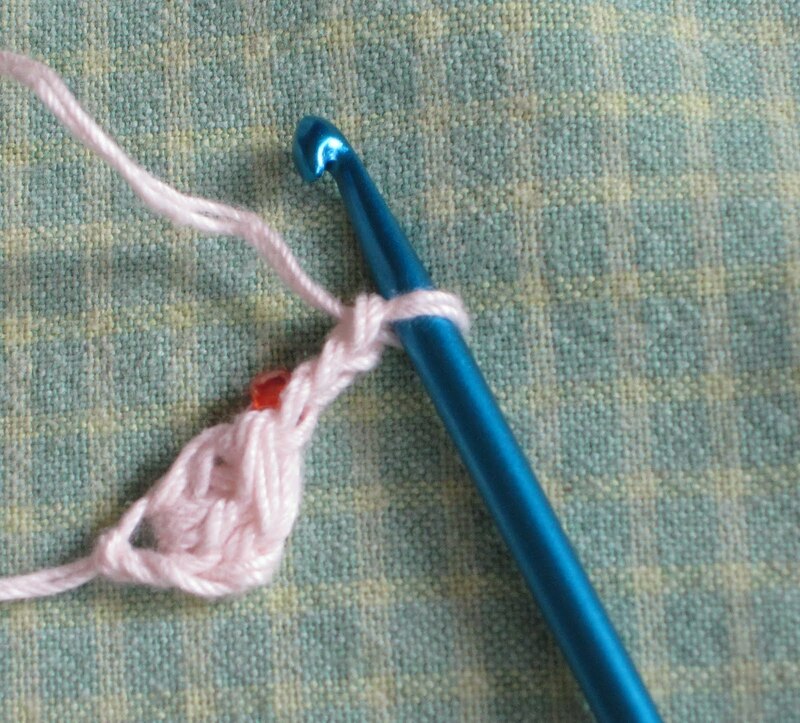 Very skinny, of course - although the pattern should work as well in a thicker yarn. You'd just have to use bigger beads I guess. i saw the same pattern used for a necklace and i just thought it's a multiple of DCs, that's why i ended up with many twisted shells on my hand! Thanks so much, Crochet Happy! And congratulations on your cancer-free anniversary. Use whatever hook works best for you. I like anything that looks or seems like shells, nautical knots, etc. 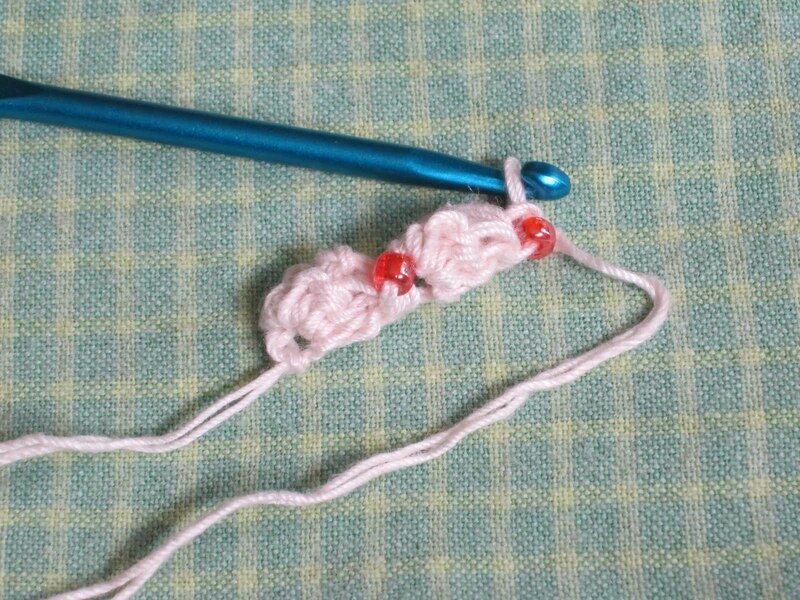 I recently just learned how to crochet with beads and wire. 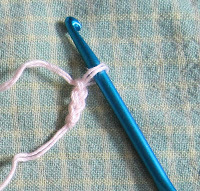 You just use the wire instead of crochet cotton or thread. 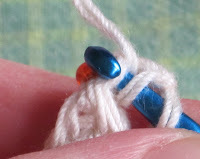 I also am trying different textures of yarn for different looks. i really enjoyed your whole blog page. i like your humor. 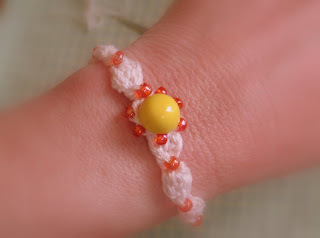 this bracelet is so cute and perfect for the light accesory i wanted to add to my summer dress, thanks for sharing. It's absolutely gorgeous and stunning Beachy Little Bracelet. I loved all the bracelets. 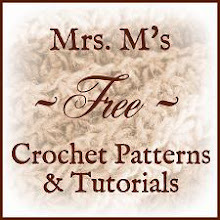 Thank you for the awsome tutorials, they are very explicite. I've already tried to make the sea anemone, and the beachy little bracelet, they are very cute!! Can i use the pattern for selling?? You may sell the items you make from this pattern, but you may not sell the pattern or reproduce its text without permission. If you do sell items made from the pattern, please credit the designer (that's me). No Muffin Cups for Me!